So you thought the first Coca Cola drinking bears were the polar bears in Coke's advertising campaign in 1993. Not so! 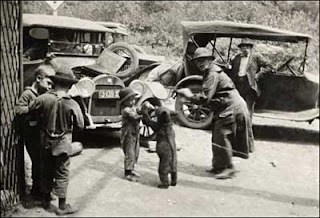 Let me introduce you to a pair of twin black bear cubs guzzling Coca Cola in 1926. This is one of my very favorite family photos of my father-in-law Lewis and his twin brother Bill. The photograph was taken to commemorate a trip by three generations of my husband’s family to Yellowstone National Park. My father-in-law says the bears were kept just outside the park entrances in roadside attractions. You paid a fee, bought a bottle of coke, fed the bears, and took photographs. I'm not the only one interested in this theme. 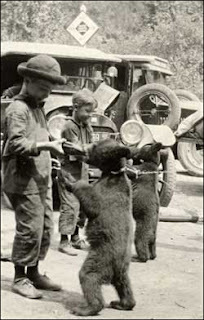 Twin bear cubs held a fascination for Yellowstone Park as well. 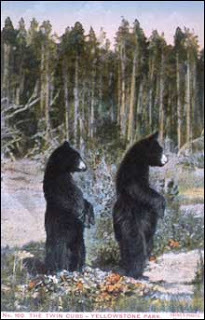 Frank J. Haynes produced this postcard of "The Twin Cubs" for the park service in about that same time period. The photograph of my father-in-law was taken during the summer of 1926. This is an educated guess. I believe it's summer because there is a fire danger sign in the background. Fire danger in Montana is predominately during the summer months. There is an old joke that goes something like this – When is summer in Montana? It depends on whether it falls on a Saturday or Sunday. The roads in the photograph are hard and dry. 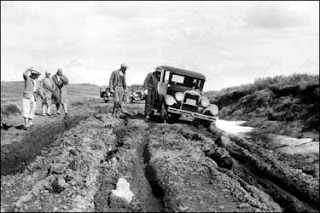 Travel for long distances by automobile in Montana in 1926 would have occurred during the summer, as roads were often impassible in the winter. My father-in-law and his parents would have been traveling from eastern Montana near the Canadian border and his grandparents would have been traveling from Salem, Oregon. This would have been a long trip and no Montanan would have attempted travel of this distance over roads in Montana in the winter. The 1925 photograph below shows ice beside the road and an automobile stuck in a rut in or near Yellowstone. The photograph was probably taken in the late spring. The year of my photograph is most probably 1926. My father-in-law was unable to tell me when the photograph was taken. Originally, I had thought the license plate was a 1926 Montana plate, but after receiving the photograph below and blowing up just the license plate, I discovered it was an Oregon plate. An Internet search of Oregon plates revealed that the plate was issued in 1926. This would make the twins eight years old, as they were born in 1918. That looks correct. In this photograph it appears the bear cub is mugging the baby (Del, 4 years old) for the coke bottle and grandma is coming to his rescue while yelling for help. Wild animals and babies couldn't have been a good combination. Oh, and knowing my father-in-law, he and his brother are plotting how to skin the bears and get them in the car. My father-in-law was a taxidermist in later life. Can't you just image how much Coca Cola the two cubs drank during the summer months? They must have had withdrawals in the winter, as Coca Cola didn't become cocaine free until 1929. What happened to them when they were no longer cute little bear cubs? Were they turned back into the wild? I doubt it. They didn't know how to fend for themselves and they were far too comfortable with humans, so I imagine their fate was sealed. I know - so not politically correct, but a slice of Americana none the less. The Coca Cola Company maintains there were only trace amounts of cocaine in Coca Cola during the period of time these bear cubs were drinkers. There is an excellent article on Coca Cola and all its famous ingredients at the Golden Age Spotlight on Advertising. Great photos and interesting story, Maven! Reminded me of my growing-up years in Southeast Alaska, where black bears (and their cubs) were an ordinary part of life. Is it true black bears only eat tourists? History is not politically correct, and so I always enjoy an article that tells the TRUE history, not a fantasized or edited version. Kudos, it was fun to read.